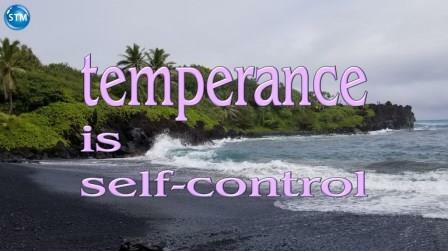 Temperance aka self-control is to avoid excess. To not over-do-it. Give yourself 5 minutes to learn more! But the fruit of the Spirit is love, joy, peace, longsuffering, gentleness, goodness, faith, 23 Meekness, temperance: against such there is no law [Galatians 5:22-23 (KJV)]. G1466 ἐγκράτεια egkrateia (eng-kra’-tei-a) n. self-control (especially continence). The virtue of one who masters his desires and passions, especially his sensual appetites1. This is a brief lesson to aid in getting to know the meaning and use of ‘temperance’. Darby (1890) was the first to translate egkrateia as ‘self-control’. Since that time more and more of the modern translators have done the same. However, this lesson will focus on temperance. Habitual moderation in regard to the indulgence of the natural appetites and passions2. Often defined as abstinence from alcoholic drinks. Self-control. It is important for you to know that temperance was found in three verses in the KJV. In Acts 24:25, Galatians 5:23, and 2 Peter 1:6. The New KJV and Revised KJNT translators always replace it with ‘self-control’. G1467 ἐγκρατεύομαι egkrateuomai (eng-kra-tev’-o-mai) v. 1) to exercise self-restraint (in diet and chastity). 2) to be self-controlled. Definition: To exercise power or self-control. Usage: egkrateuomai is used twice in the KJV. 1 Corinthians 7:9 ‘they cannot contain‘ meaning abstain from sexual relations ‘they should marry‘. 1 Corinthians 9:25 ‘temperate‘ in a figure drawn from athletes, who in preparing themselves for the games abstained from unwholesome food, wine, and sexual indulgence3. G1468 ἐγκρατής egkrates (eng-kra-tees’) adj. 1. strong in a thing (masterful). 2. (figuratively and reflexively) self-controlled (in appetite, etc.). Usage: egkrates (temperate) is used once in the KJV. Titus 1:8 specifying that one of the qualifications of an elder/bishop is that he be ‘temperate’ (self-controlled). G4998 σώφρων sophron (sō’-frōn) adj. 1. (literally) safe (sound) in mind. 2. (generally) self-controlled. 3. (by extension) moderate (as to opinion or passion). Definition: curbing one’s desires and impulses, self-controlled. Usage: in 1 Timothy 3:2 and Titus 1:8 ‘sophron’ is “sober” in the KJV. ‘Temperate‘ in Titus 2:2 and ‘discreet‘ in Titus 2:5. Vine’s says “the various powers bestowed by God upon man are capable of abuse. The right use demands the controlling power of the will under the operation of the Spirit of God6“. Remember this, the Holy Spirit enables you to have power over yourself. That power is for you to use. So, I urge you to use ‘self-control’! Acts 24:22-27 (25); Galatians 5:16-26 (22-23); 2 Peter 1:5-11 (6). 1 Corinthians 7:1-9 (8-9) and 9:24-27 (25). Titus 1:5-9 (8). 1 biblehub.com || 2 webstersdictionary1828.com || 3 lexiconcordance.com || 4blueletterbible.org || internationalstandardbible.com || 5 studylight.org || 6 W. E. Vine’s New Testament Word Pictures: Matthew to Acts page 970. Control: You Can Take Control of YOU!